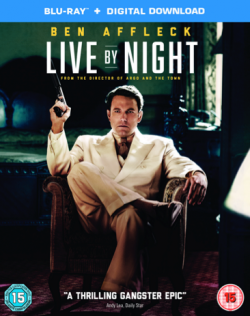 Oscar winner Ben Affleck (“Argo”) directs and stars in LIVE BY NIGHT, the action-packed crime thriller, set in the Roaring 20s amidst an underground network of gangster-run speakeasies. Go behind the glamour where rules are broken and secrets are uncovered when LIVE BY NIGHT becomes available to own on Blu-ray™ and DVD from May 22 and Digital Download from May 8. LIVE BY NIGHT features an all-star cast, including Ben Affleck (“Argo”), Elle Fanning (“Maleficent”), Brendan Gleeson (“In the Heart of the Sea,” the “Harry Potter” films), Chris Messina (“Argo,” “The Mindy Project”), Sienna Miller (“American Sniper,” “Foxcatcher”), Zoe Saldana (“Guardians of the Galaxy,” “Avatar”) and Oscar winner Chris Cooper (“Adaptation,” “The Town”). Affleck, alongside directing and starring in LIVE BY NIGHT also wrote the screenplay, based on the award-winning best-seller by Dennis Lehane. The film is produced by Leonardo DiCaprio and Jennifer Davisson Killoran, under the Appian Way banner; and Ben Affleck and Jennifer Todd for Pearl Street Films. Serving as executive producers are Chris Brigham, Dennis Lehane and Chay Carter.